Georgann Prochaska grew up in the Chicago area, studied literature at Illinois State University, and taught high school students for thirty-four years. After retiring, she became a caregiver and learned about suspicions and secrets from her mother who had Alzheimer’s Disease. Those discoveries spun her into writing mysteries. Her two amateur sleuths solve cold cases in small towns filled with secrets. “The Case of the Girl Who Didn’t Smile” is the first of the series and was named into the top ten by Lascaux, 2016. “The Case of the Hound Who Didn’t Stay” is the second in the series and introduces a bloodhound. “The Case of the Ex Who Plotted Revenge,” the third of the Snoopypuss series, won second place in the Royal Dragonfly Mysteries. The fourth, “Murder Comes to the Vineyard” came out in 2018. Welcome, Georgann! Thank you for joining us today at Reader Views. How long have you been writing and what inspired you to write mysteries? From the time I was a kid, I’ve written something. Most of it hit the trash. School and chores filled early days, and a teaching career left no time for primping vocabulary or tidying sentences. But I read mysteries: works like Nancy Drew, the Hardy Boys, and Miss Marple. When modern female sleuths hit the market, I tore through Sara Paretsky, Anne Perry, and Sue Grafton. After I retired and researched my family history, my love of writing returned. My family had stories to share. What is “Murder Comes to the Vineyard,” the 4th book in your Snoopypuss Mystery series, all about? It’s about defining family. Just how important is a blood relationship? 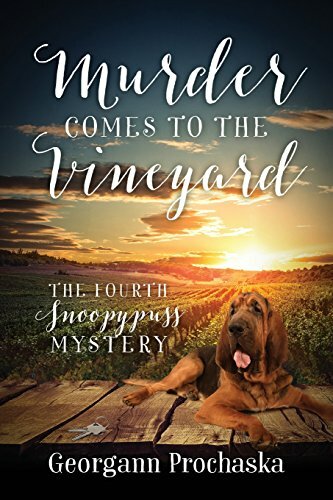 My amateur sleuth, Alice Tricklebank, wants to see her grandson graduate from high school, but she has a bloodhound with issues and that takes her to a cottage at a vineyard where a woman is terrified her husband may have killed their son during an angry argument. Of course, on her first night, Alice awakens to gun shots and learns her hostess has been murdered. Another body is found in the vineyard. Soon Alice is involved with bikers with a reputation for toughness. Does their reputation all them to tolerate family missteps? Tell us a bit about your main characters, Alice and Audrey. Are they the protagonists in the entire series? Once Alice retired from teaching, she and her husband Baer planned to travel. He, however, passed away, and Alice struggled with her grief. In the first book in the series, “The Case of the Girl Who Didn’t Smile,” Alice’s best friend Lena lures Alice into looking for a neglected child accused of arson. At the end of that book, Audrey comes to Alice’s backdoor for rescue. Alice reasons the bloodhound with loneliness issues is her gift from Baer. Her life becomes built around the companionship with Audrey. She often wonders who rescued whom. Alice trains Audrey as a search and rescue dog, and the series is born. How can she not help people when Audrey wants to trail smells? Do you have a personal connection with bloodhounds? I love dogs who have a wisdom of their own. It seemed ideal for amateur sleuth Alice to have the best nose in the business. I’ve never owned a bloodhound, so I researched people who know the breed as pets and as working dogs. Enter the Northern California/West Coast Bloodhound organization who have been fabulous answering my questions and giving me insight into this special breed. An independent, sometimes clumsy hound with a talented big nose hardwired to their brains. Did you know you were going to write a series when you wrote the first book? In my mind it was a series. Alice and Lena have been in my head for at least ten years before I wrote the first word. I wanted active older women to tell about friendship, family, and commitment, and they were tired of older women being airbrushed out of stories. But I admit the mysteries do set up a bit like a joke: two grandmothers, a Vietnam veteran, and a bloodhound walk into a murder. How do you keep the narrative fresh in a series? Much of the story is in dialogue. I do a lot of eavesdropping. And I read small town newspaper which are quite different from those covering big cities. Readers have suggested settings or characters to include. Although, a couple friends have said they may not tell me any more embarrassing stories. Do you write every day? Tell us about your writing schedule. What is a typical day like? I certainly try to write every day. Typically, I’m up at four or five in the morning and write until seven. After breakfast, I’m back at it for another two hours. If I don’t have something new to write into the storyline, I rewrite chapters. Dang, this sounds like drudgery, but I like it. A little laughter, a little squirming. Audrey’s slobber causes some to cringe. I hope the pages fly by. I’ve had people ask if the stories are real. In some sense, yes. One woman said Lena and Alice are like her relationship with a friend. Lena may be in her sixties, but she notices men and thinks like a sixteen-year-old girl. Alice, also in her sixties, problem solves with the curiosity of a twelve-year-old. Readers worry about them. How do you feel when you finish writing a novel? Let’s say the mystery draft is off to the editor (so I’m not quite done with it yet), the next week I begin the new mystery. Readers talk about liking character-driven stories. Mine certainly are. My characters have the next mystery lined up and have conversations going in my head to let me know who is murdered. I like meeting potential readers and readers of the series. I like the glint that comes into their eyes as a potential reader hears the main characters are older women. I frequently hear “About time.” Or I might hear stories from readers who own bloodhounds. For the first four mysteries, Lena has dangled marriage in front of Julian, but murders always seem to interfere. Readers tell me they are worried for her. Lately I hear, “When is Alice going to have a man in her life?” I like that readers are concerned. I’m caught between the character Alice has become and bending to readers’ suggestions. It’s a good but difficult conversation to have with Alice. I’m not thrilled with learning about marketing a mystery. Usually I don’t have writer’s block, but I do have chronic marketing paralysis. I’d rather be writing. Mysteries. And poetry. But because of a time crunch, internet blogs, online literary magazines, and stories embedded in genealogy have become important. Which writers have inspired your own writing? What is one thing you wish you knew when you started your writing journey? Here’s where the old fogey comes in. The publicity avenues are constantly changing, and like Alice, I’m retired. Learning about social media, measuring Amazon versus Barnes and Noble, building relationships with independent book stores—all takes time, and I question whether I’m doing it right. But, book fairs have been wonderful, independent book stores very helpful, and I’m very blessed with terrific family and friends. Work on genealogy. I find little stories about family members have crept into experiences for my characters. Even an ancestor who ended up in Leavenworth for killing a neighbor over a cow. Or a woman who annoyed her neighbors by painting flowers on her house only to lose them in the rain – but then she had a new canvas. Mostly in decade-old family stories, I see children forced to grow up too soon--coping with loss, fear, lies, violence, neglect, and trauma. Some developed skills of trust, self-reliance, independence, confidence. Some held their anger and wanted revenge. “Murder Comes to Grindstone” will be out in the early summer of 2019. Alice has her grandson visiting for the summer when a tornado hits the town of Grindstone. Joining his grandmother and Audrey in finding trapped people, Henry discovers in a basement two children latched into a dog kennel. Oh yes, he also must move a murdered woman’s body—not exactly the summer Grandma planned. I’ve started “Murder Comes to Madtree” which should be my 2020 mystery. As Lena and Julian get married, a steam of police cars pulls into Elizabeth Madtree’s Apple Orchard Resort. Always happy to hear from people on Facebook at https://www.facebook.com/GeorgannProchaska/ or in Messaging. Listen to the voices in your head (you know they’re there). And research! Read fiction and non-fiction, of course, but don’t be afraid to ask people for information. The world is full of nice people willing to share knowledge. Alice trusts her posse, and I’m thankful for mine. I appreciate when sorrow and humor dovetail in stories. I learned that by writing about being a caregiver for my mother who had Alzheimer’s and my aunt who had dementia. I hope “On Little Cat Feet” gives permission for caregivers to laugh. Thank you so much for joining us at Reader Views today Georgann! We look forward to reading more of your works in the future!